The author recounts his experience getting an audience with the one and only Muhammad Ali as he prepared for his 1973 bout with Ken Norton. At the end of a recent day, in which two terrorist attacks in Europe had ended more lives and rattled more nerves, I came upon him by chance. He was in a drawer, in an old magazine photo. His mouth was open famously wide, his brown eyes lit with a shimmering mischief that, even in my boyhood’s worst moments, a half-century ago, always made me feel a little better. Now, just as then, I smiled, as if I were 13 years old again. Thank you for that, I wanted to say to him. At the end of a year filled with numbing global horrors and American political tumult, I’m writing this in 2016’s last days to celebrate a wondrous life, acknowledge a debt, and share a story. Here’s the kind of obsession he inspired: In my youth, I wore white athletic shoes, because he did. I sometimes warmed up for playground games by performing for my puzzled friends a peculiar-looking dance, bounding swiftly clockwise, because he did. When I first tried my hand, in the fifth grade, at writing a two-page biography littered with misspellings and shameless adoration, it was all about him. So it made perfect sense to me that at 20, by then an impulsive college student with loose ties to a university newspaper and an invitation from no one, I went off to see Muhammad Ali. It was late August of 1973. He had a fight approaching. As a boxer, he was perhaps 80% of what he had been during his supremacy of the Sixties, his dance and reflexes noticeably dimmed. Earlier that year, he had suffered a broken jaw in a loss to a previously little known heavyweight named Ken Norton. In 1971, he had lost to Joe Frazier, in the first of their three fights. Yet, even at 80%, he was still Ali. Although many doubted he could beat Norton in the coming rematch and few gave him any chance of ever beating the younger, bigger-punching, fearsome new heavyweight champion George Foreman, he was still the most arresting presence in sports. And I was a punk kid headed his way. He trained in the Pennsylvania Poconos, in the rustic town of Deer Lake. I’d called his renowned trainer, Angelo Dundee, and asked if I could watch an Ali sparring session. Dundee gave me directions and wished me luck. I spent what money I had on a flight to Philadelphia, a long bus ride that got me into Deer Lake at dark, and a night’s stay at a budget motel. The next morning, I trekked alone up a dusty hill to the camp. In an early lesson that my fantasies might be someone else’s headache, the hero was not pleased. “What are you doing here?” Ali demanded. His rematch with Norton was about three weeks away. Any opportunity for fighting Frazier or Foreman hinged on beating Norton. Professionally, the stakes were life and death. Ali made it clear to me he didn’t need any distractions, least of all an idolizing kid in the camp. I could not return the next day. I didn’t have money for another motel stay if I wanted to make it back to school. It was okay. I’d met him and that was enough. I explained the reality of the situation, thanked him for letting me watch and was ready to leave when he sighed. “How can you have no money?” he demanded. He could hardly have been more exasperated. Groaning in frustration, he said I’d just have to sleep in one of his cabins. One of his aides rolled out a foldout on a couch in the sparring gym and I spent the night. I interviewed Ali the next day over breakfast. “You show up with no money,” he said over and over at the start, still unable to get over this bit of craziness. But he had been 20 himself once and said he could remember just how crazy 20 could be, how just being young made you feel like you could show up anywhere without a dime and expect famous people to listen as you told them you were going to become heavyweight champion of the world, and sometimes they actually listened and gave you a Coca-Cola and didn’t mind when you shadow-boxed around their hotel rooms and acted just plain crazy. 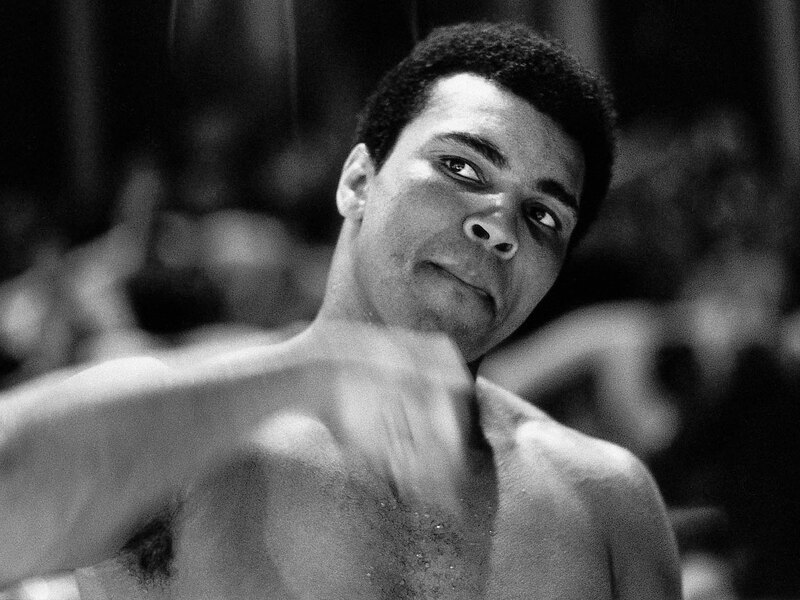 He recalled that, out of the blue, at 17, he had gone to a Louisville hotel and called up to the room of the world’s light-heavyweight champion at the time, a slick boxer named Willie Pastrano, and asked if he could meet him. “I just called,” he said. Pastrano was trained by Dundee, whom he’d never met either. Dundee invited him up and a relationship was born. “Seventeen,” Ali said, laughing at the image of his young self, and letting out another of those big bass sighs. He was 31 by then, an old 31: life had belted him around hard. In 1967, after he had refused induction into the armed forces and declared himself a conscientious objector during the Vietnam War, boxing’s officials stripped him of his title as heavyweight champion, just a prelude to his conviction for draft evasion, the likelihood of imprisonment, and the decision by many states to deny him a license to fight. For more than three and a half years, between the age of 25 and 28—a period that encompassed his prime years as a boxer—he couldn’t practice his livelihood and lost millions. For my friends and other young Americans yearning for someone to demonstrate a commitment to principle, this was it. Our affection for him went unshared by many older Americans, who viewed him as a lout. The polarization resulted in an odd duality: At the peak of his physical powers, Ali was both the most popular athlete in America and its most reviled. The Supreme Court had since reversed his draft conviction, but, in Deer Lake, he observed he would never be able to get the lost years back. His feelings about the country and his place in it remained raw and complicated. Two white men, trainer Dundee and a devoted aide, Gene Kilroy, were beloved members of his staff, but Ali had also adopted a racial separatist’s philosophy for the time being. He told me, in complete seriousness, that he entertained the idea of leaving America once his career ended and moving with friends to Africa, because America was doomed. His prickliness comprised a part of his personality then, a fact often lost nowadays in the encomiums about him. The most memorable image of him from the last 20 years of his life was that of his Parkinson’s disease on full display for all the world to see, of his trembling hands lighting the torch at Atlanta’s 1996 Olympic Games, by which time he had been cast as the planet’s goodwill ambassador. As the larger public’s view of him shifted from contentious firebrand to secular saint, he was increasingly depicted as a man without edges, a jolly soul as benign as Mr. Rogers. The portrait did Ali a disservice, masking the extraordinary arc of his personal growth and acquired wisdom. In reality, he had struggled for a long while, like millions of other Americans, with issues of race and social divisions during the Sixties and Seventies, caught in a maelstrom that sometimes made moderation feel unseemly and unmanly. His path to reconciliation with his country did not come at all easily, which made it all the more moving. He was done talking to me for a while. Aides and sparring partners accompanied him on a ride to a farm, where Ali hoped to buy an antique rustic-looking stove for the training camp’s kitchen. He knocked on a door and an elderly white woman answered. She just stared at him for a few seconds, open-mouthed and frozen in stupefaction. Next she squealed and screamed his name, at last finding him a chair. Her excited husband joined them to gab about the stove and the upcoming fight. In the couple’s presence, Ali was young, shy, earnest, not speaking until spoken to. He thanked them for a glass of juice, complimented them on their home and, responding softly to the woman’s question, said, yes, he thought his broken jaw had healed just fine—thank you very much for caring. An aide raised a finger and said something to him about the time. But Ali was in no rush to leave, having found a small slice of peace here. When they finally exchanged goodbyes, the woman said they were praying for him to win and gave Ali a maternal hug. Ali hugged her back. The husband warmly clasped his hand. Older White America’s attitude toward him was softening. The Vietnam War had fallen into disfavor nearly everywhere and people wanted an end to the recriminations. Nudged into talking, the laconic farmer observed that Ali had paid the price for his beliefs, had never run and now ought to be left alone—hadn’t the courts said so? 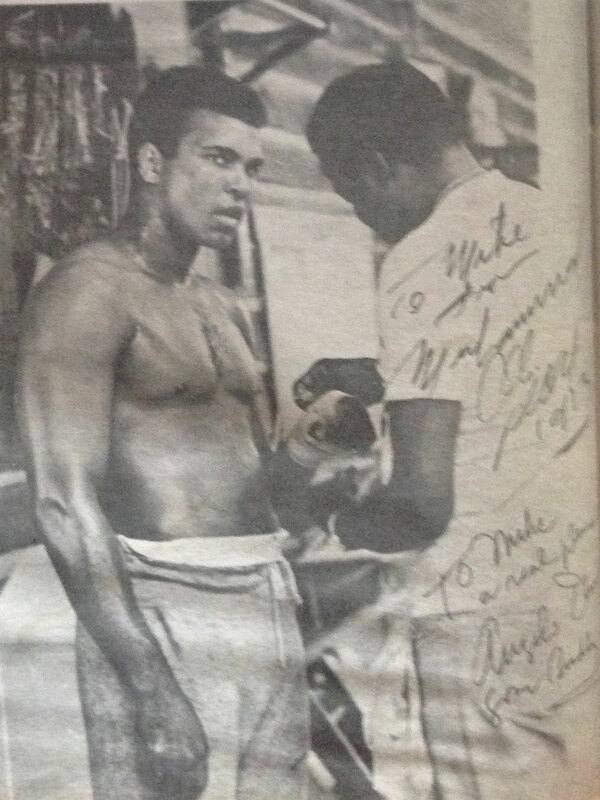 Ali and his friend Bundini Brown in an autographed photo provided by the author that ran with his story in the Yale Daily News in 1973. They gonna put your story in your school newspaper? He laughed and let the fly go. They pay you? But you gotta do what you like. He said he understood this, before adding: I’m gonna dance; I’m gonna destroy Norton. Write that down. Then Frazier and Foreman. I’ll be champion as long as I want. Maybe when I’m 50 I’ll let somebody have it. Gotta do what you like. We talked for a long stretch on the boulder. A couple of weeks later, my story, such as it was, ran in my college newspaper, the Yale Daily News. I never met Ali again. Yet in the years that followed, whenever he spoke on TV about soon ending his boxing career because it was so hard, only to change his mind later and continue absorbing punishment, I remembered our exchange. I remembered his bright tone in Deer Lake and how it had conveyed all his love and addiction for a sport that he couldn’t give up, that he wouldn’t give up; that would lead in time to beatings he shouldn’t have taken and the Parkinson’s that came with them. And that’s more than a little painful to think about. But I also remember how his voice that day held all the optimism and fortitude that made him who he was. It was transformative, and history should record just how many of us he moved, people of all races and backgrounds, in ways big and small, to find our own dances and voices. He was a marvel, and nothing less than the most important athlete of the 20th century.